D&D’s Tomb of Annihiltion dice set retails for $19.95. Buy a set here. Dungeons & Dragons is pulling out all the stops for Tomb of Annihilation. In addition to the adventure module, Wizards of the Coast is releasing a host of other products including a board game, miniatures and more. One of those products is the Tomb of Annihilation dice set, a set of 10 dice designed to match up with the adventure module. D&D graciously sent us a set of the dice, which retail for a whopping $20, and we opened up the box and gave them a roll. The good: The dice tin is cool. It’s a shade of pale green and the top is stamped with the demon face well-known from Tomb of Horrors and, now, for Tomb of Annihilation as well. The bad: The dice are just OK. It’s a standard array of gaming dice (d20, d12, d10, percentile d10, d8, d6, d4) with extra d6 (four in total), but they’re nothing fancy. They roll well and seem well-crafted. The extra d6 are a nice touch, and the crisp white numbers on the dice are easy to read, especially from a distance on the table. Will I use the dice? Certainly. Would I purchase the dice? Probably not. The short version: I like these dice fine, and they’ll find a spot in my dice bag and on my gaming table, too. I’ll likely use the tin to cart around miniatures or tokens or something. But $20 is a big price tag. These are priced high enough that they’re definitely for collectors who want anything Tomb of Annihilation-related. If this product was in the $10 to $15 range, it’d be great, especially for new players. But $20? It seems like a lot for a standard set of dice and a tin. You could buy two sets of Chessex’s fanciest dice for about the same price. That said, you may be in love with Acererak or Tomb of Horrors might be your favorite adventure. Perhaps the tin is just what you need. In that case: Go nuts. 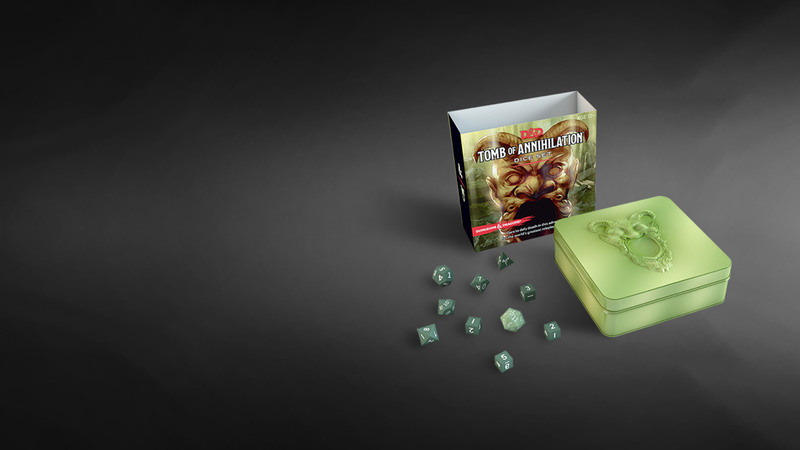 Purchase the Tomb of Annihilation dice set from Amazon here. What do you think of the dice set? Let us know in the comments!